People’s attitudes and thoughts towards sewing have fluctuated a lot over time, but something that has stayed consistent is its attachment to femininity and, ultimately, the “role of women”. This relationship is complicated, but overall, it’s critical to examine it in all its mess. 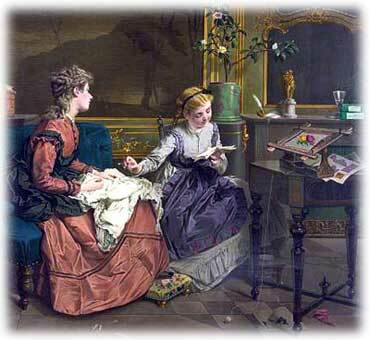 Ever since sewing was invented, it’s been mostly a woman’s job. Sewing, as a sedentary and tedious task, suited the lifestyle of prehistoric women: they were better able to sew as they stayed close to home while the men went out and hunted for meat. In particular, sewing was a way for pregnant women and mothers watching their children to be able to be productive once gathering food was no longer an option. It’s hard to say whether sewing caused women to be perceived as more domestic, or if women’s natural domesticity is what caused them to become the main sewists; it’s a bit like wondering whether the chicken or egg came first. Either way, both women and the act of sewing are seen as “domestic,” which has led to many problems with how women are treated and seen by others. A museum display curator, named Danielle Thom, created an exhibit showing a selection of sewing and knitting tools at the Victoria and Albert Museum in London. She followed up on the exhibit with a piece about the significance of sewing in relation to women and women’s lives. It’s worth noting that while some men have practiced sewing, and some still do today, it has never been an expectation for them to know how to sew in the way it has been for women. For centuries, sewing was seen as a necessary and suitable pastime for women, a reflection of traits that were -- and still are -- seen as “desirable” in women: demure, gentle, passive, and quiet. “Sewing was compatible with the domestic, self-sacrificing, and industrious pursuits of the ideal woman,” Thom says. She then quotes a letter sent between women from 1811: “[Sewing] accords with most of the indoor employments of men, who… do not much like to see us engaged in anything which abstracts us too much from them… It can be brought into the sick room without diminishing our attention to an invalid.” Since men’s expectations at the time were for their women to focus on taking care of them, the family, and the house, they preferred that their women not have extremely time-consuming hobbies or ones that took them away from the home. When taking care of others, sewing kept the women busy, but not too busy that they couldn’t stop when they needed to do something for the person they were looking after. The letter Thom quoted mentioned the sick room, but caring for others can be expanded to watching over the children while the men were at work. Across time, the societal view of a woman’s purpose has continued to be supporting the men in her life and to keep her suffering quiet in order to take care of others. Before women gained some independence after 1900, marriage and childbearing were seen as the objectives women were supposed to aim for. Thom brings up the point that sewing has been a way for women to prove that they have these “desirable” qualities that would make them suitable wives and mothers: not only a willingness to be gentle, quiet, and passive, but also good at taking care of the home and the husband. As a job, sewing was often the only respectable way to make a living, but the pay was, as Thom puts it, “appallingly low.” Women and their families couldn’t live off of just this pay alone, and prostitution was commonly resorted to in order to supplement seamstresses’ wages when they couldn’t afford to keep food on the table. To make things even worse, the women had to pay a deposit on the materials they were working on to their overseer, which was paid back only after they delivered the finished products. The conditions of the work were also appalling, causing injuries to eyesight and the spine as workers squinted at the tiny stitches and were constantly hunched over. Once the sewing machine was invented, the labor itself became easier and quicker, but women were still the ones operating the machines. In addition, sewing machines separated those who could afford beautiful, quality ones with those who couldn’t. 50 years after the sewing machine was invented in America by Isaac Singer, prices dropped and poorer women could finally buy them. Thom says, “The sewing machine in its heyday marked the high point of home sewing as a leisure pursuit, praised in ladies’ journals and illustrated magazines for its efficiency and pleasantness.” But once poorer people could afford them, the machines were seen less as beautiful products to show off and more as something to hide. 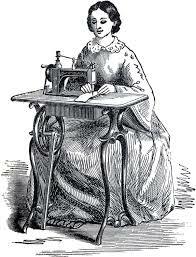 The availability of ready-wear clothing in stores meant that sewing machines at home became seen as cheap and thrifty. During the Second World War, material began to be rationed, and a program called Make Do and Mend was started in the 1940s. According to the Cooper Hewitt Museum in New York, buying new clothes was limited by coupons, encouraging people to take care of their belongings and find ways to make their own clothes. The message of making do and mending was advertised by the government as a patriotic duty and was promoted through booklets, posters, and magazines. These often included tips on how to stay stylish, repair materials, and make old things new again, which brought the sewing machine back into society as a normal, and even popular, thing to have and use in the house. Nowadays, sewing, knitting, and other creative crafts have been reclaimed by women as ways to express creativity and also to elevate the status of these activities that are “ignored by the mainstream art establishment because of their feminine and domestic associations,” (Thom). A new focus on sustainability has also helped sewing-related crafts to reemerge as a way to protest, as well as practice everyday sustainability.